If you have missing teeth, you have several different tooth replacement options. While having a choice is always nice, it can become confusing and frustrating if you don’t understand how your options differ. If you prefer a fixed, permanent tooth replacement choice, you are probably deciding between dental implants and dental bridges. Dr. Koo can help you find the solution that will be best suited for your individual preferences and health needs. If you need help with untreated tooth loss, schedule a tooth replacement consultation appointment with Dr. Koo and Piney Point OMS today. Dr. Koo is a highly skilled oral surgeon, now proudly restoring smiles daily throughout the greater Houston, TX, area including: Stafford, Meyerland, Bellaire, Lamar Terrace, Galleria, Briargrove, Rice Military, Heights, Bunker Hill Village, Hunters Creek Village, Hedwig Village, Katy, and the surrounding communities. Dental bridges are fixed prosthetic teeth attached to surrounding natural teeth that have been crowned for protection. The false tooth literally “bridges the gap” between your natural teeth. For a long time, fixed dental bridges were the best alternative to partial dentures. However, bridges pose a long term oral health problem. In order to place a new dental bridge, the natural teeth that lie on either side of the bridge must be filed down and shaped. This important step in the bridge fabrication process can make these remaining teeth prone to decay, gum disease, and inner tooth infections. While this may not always be the case, it certainly poses a substantial risk to your long term dental health maintenance. Dental implants are actually small biocompatible titanium posts used to recreate a missing tooth. Unlike fixed dental bridges, dental implants actually have the ability to replace your missing tooth’s root. The titanium fuses with your natural bone to form an organic bond, much like the original bond between your natural tooth and the jaw bone. This renewed relationship is essential to avoid the bone loss that would normally occur with any other tooth replacement option. Dental implants are can be capped with a dental crown, which accurately replicates the visible portion of a tooth. And unlike fixed bridges, your surrounding teeth are never harmed. Many patients assume that dental bridges are the more affordable tooth replacement choice. That’s a fair assumption, considering that the upfront fees for dental implant surgery can far exceed the cost for a fixed dental bridge. However, when you compare the cost versus value, the dental implant is much more cost-effective. Dental implants will not wear down or need replacement like dental bridges, and you don’t have to worry about decay of surrounding teeth which could amount to thousands of dollars in future restorative costs. 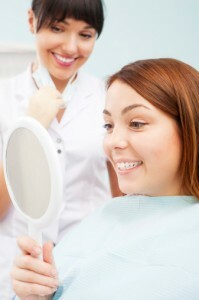 If you’re a good candidate for oral surgery, dental implants are the clear choice. To get started, just schedule your dental implants consultation appointment with Dr. Koo and Piney Point OMS today. Dr. Koo is a trusted oral surgeon, now delivering quality care daily throughout the greater Houston, TX, area including: Stafford, Meyerland, Bellaire, Lamar Terrace, Galleria, Briargrove, Rice Military, Heights, Bunker Hill Village, Hunters Creek Village, Hedwig Village, Katy, and the neighboring cities.